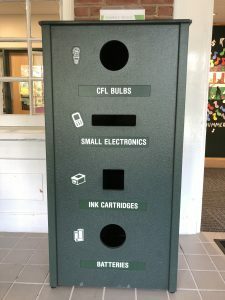 The Town of Bloomfield now offers kiosks for residential household recycle items. Kiosks have been installed at the Prosser Public Library, Town Hall, and Human Services buildings. The multi-bin E-cycler is an easy solution to keep common electronic waste out of landfills. This entry was posted in In Bloom on July 17, 2018 .